What southern garden is complete without the majestic, fragrant Magnolia tree? If you’ve long admired the beauty of Magnolias, you’ll be happy to learn that they’re quite easy to grow. And with over 80 species native to North America and Asia, there’s sure to be one that’s right for your yard. – Require very little care. – Are resistant to many diseases and pests. – Tolerate harsh Southern summers. – Seeds and foliage are favorites of migrating birds. As you dream about Magnolias in your yard, keep in mind that there are many different species and varieties to choose from. They range in size from 20 to 80 feet (6 to 24 m) tall, with both evergreen and deciduous species. Soil: Slightly acidic, moist, loose, well-draining soil. To mimic Magnolia’s natural conditions, amend heavy soil with peat moss and compost. Hardiness: Grow best in Zones 7-10, depending on variety, with a few cultivars hardy to zone 5. Light: Full sun to partial shade. 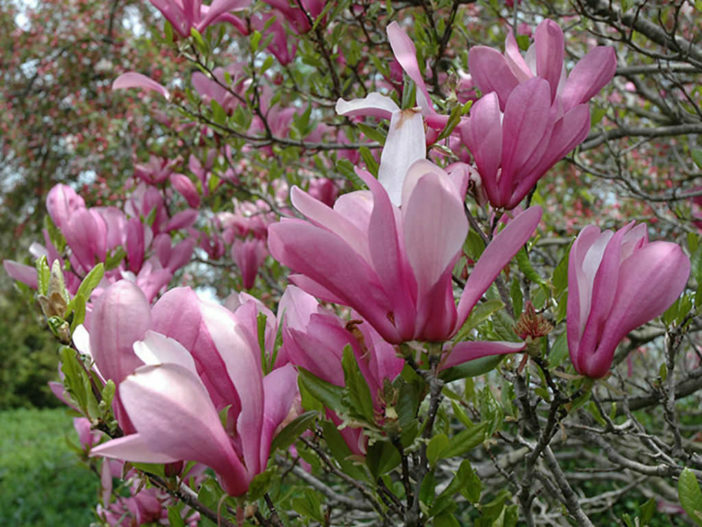 Moist, peaty soil can help Magnolias tolerate full sun. If you’re pushing the limits of cold tolerance, avoid planting Magnolias in southern exposure since the leaves can be damaged by winter sun and flowers may open prematurely. Water: Magnolias benefit from irrigation the first few years, then they are tolerant of moderate drought. Space: They need room to grow to their full mature size and width. While looking small when first planted, over time they’ll grow to fill up the space. Flowers: Some varieties of Magnolia don’t bloom until 15 years old, so be sure to choose one that’s fits your needs and expectations. Grafted plants (rather than seed-grown) bloom sooner. Timing: Plant container-grown and balled-and-burlapped Magnolias in fall or spring. Plant field-grown or transplanted Magnolias in early spring. Avoid fall planting if you’re pushing the limits of cold tolerance. Spread Roots: When planting, be sure to cut any roots that are circling the root ball. Magnolias have a tendency to girdle (or become rootbound) if the roots aren’t spread out. Water: Give your new Magnolia one inch of water per week. Fertilizer: Don’t fertilize your newly planted Magnolia until next growing season. Then for the next three years or so, feed your Magnolia with a balanced organic fertilizer every other month between March and September, cutting back to once or twice per season after that. Support: Use stakes and lines to stabilize your new magnolia since it will be top-heavy. Problems: Magnolias are generally trouble-free, and in most cases, minor problems – such as scale or leaf spots – can be left untreated. Pruning: If you want to prune or shape your Magnolia, do it while the tree is very young since large branches don’t heal very well from pruning. Bark Damage: Magnolias are susceptible to bark damage and breakage, so avoid hitting them with the string trimmer or lawn mower. Propagating: You can propagate Magnolias by collecting the seeds, or take semi-hardwood cuttings in late summer. Cuttings can take up to a year to root. Transplanting: Magnolias have an enormous, rope-like root system. They don’t usually tolerate transplanting once the trunk is 4 inches (10 cm) or larger in diameter.